Saving money is as important as earning money. Do you ever noticed how much money we actually waste throughout the day in tiny things, it could be in shape of change, impulsive buying decision, unrealistic hobbies that we will never indulge, DIY staffs that we never created. Like wise, if you start jotting down those expenses, you will be shocked by calculating that figure in the month end. In my childhood days, my Dad (Who is no longer with us) always used to tell me that if you could not earn money its better you start saving them. By telling you people to saving money, I am not telling you to skip your expenses or in any way becoming an economical person. I am just telling you to cut shot all your unnecessary spending. 1. Make a list of products what you actually required, at the time of shopping groceries, food items, household product just follow this list. Otherwise you will end up buying some unnecessary things. 2. Every eCommerce apps you install in your mobile phone send you notification about deals, offer on bulk purchase, schemes etc. Disable those notification as soon as possible, they are the reasons of your impulsive buying behavior. 3. Try to pay all your utility bills, credit card dues, EMI or other bills on time, in that way you could avoid extra charges in shape of interest or penalty. search for cash back offers on bill payment online it even helps you to get something in return. 4. Cutting down membership, subscription of products or services that you are not actually using. It might be a Tennis couching, Gym, apps for web series. Just cut down those what we don't actually using from long time. 5. Foodies spend a lot of their hard earn money outside, Its a nice kind of rewards to yourself. But do you ever noticed how much money they actually charged you for your favorite shakes, coffee, fries, Beacon, a slice of burger. If you try you could easily make this thing at home. Initially it might not be as tasty but gradually with little practice you could become a Master chef some day. Home food will always be health as compared to those outside food. Always remember to track all your expenses, it will help you to track your spending habits. Better to track those expenses in writing, as it gives you some guild feeling, and feeling stopped you doing the same sort of mistake in next month. 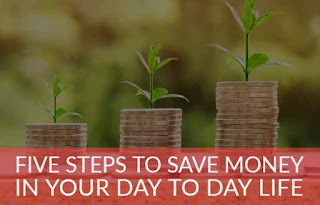 So here is, "Five Easy steps to save money in our daily life" if we just change our lifestyle a bit, it will be valuable for us and end of the month we will get extra money in our pocket.Remember that all money you save is your income.